Scheduled to pick up my daughter from UCSB on Wednesday for the Thanksgiving holiday, it seemed a good excuse to leave a few days early and do some peakbagging enroute. I was interested in a section of the Los Padres NF at the northern edge of Santa Barbara County that I had yet to visit. Old Sierra Madre Rd runs for more than 15mi to McPherson Peak along a beautiful ridgeline separating the Sisquoc and Cuyuma River drainages. The saddle where SR166 goes over the crest of the Sierra Madre Mtns marks the start of dirt Sierra Madre Rd. Leaving San Jose just after 11a, I spent almost 4hrs driving south on US101, then east on SR166, then slowly up Sierra Madre Rd. It seems it is maintained for most vehicles, even if barely, and I managed to get the van up several miles of the road to a TH for Sierra Madre BM, really just an unsigned fork in the road. I thought I might only have time for this and another easy one seeing as I had only an hour until sunset, but was inspired by fine weather with the temp in the low 60s. Porter Peak was about 5mi away, but I got out the bike I'd stuffed in the back for this and a few other peaks over the next few days. I figured I could probably get to the summit by sunset and then ride back by headlamp if necessary, but I did much better. I found the road very rideable, with only one short stretch near the summit where I needed to push it uphill. The spur road is partially washed out a short distance from Sierra Madre Rd and there are no real turnarounds before a locked gate is encountered - so beware if you are tempted to drive it! Portions of the route are on private property (I think), but the only gate I encountered was simply signed for no motor vehicles. There were signs of cattle grazing past this gate and I found a few cows where the road tops out just below the summit of Porter Peak. There is a ranch gate and some buildings just south of this point. 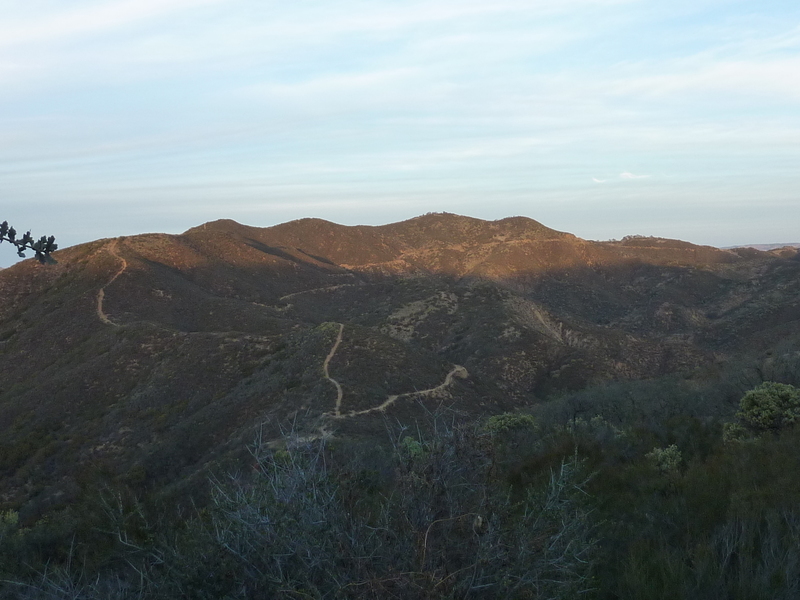 I walked the last 1/10mi to the summit with about 20min until sunset. Nice views from the mostly open summit. On my way back I stopped at an OHV trail junction and parked the bike to climb the last quarter mile of steep OHV trail up to Madre BM. The sun had set by this time and I had no real views from the second summit, but the temperature was still delightful and a crescent moon was low on the western horizon. I finished up before 5:30p, without resorting to the headlamp for an 11mi outing that came in at just under two hours.